Training Karate | FITAPPY Fitness & Healthy Plan to Change your Life! Many people have been asking me about videos, in which I will teach karate. Although, one can learn some kicking or punching techniques from videos, I don’t believe you can learn karate. First of all, it’s a form of art – that’s why it’s called martial arts. It has to be cultivated by passion, not by desire to learn fighting. Karate should be not only in your strong body, but also in your mind and your heart- and that takes time and personal development. Now, from a different angle, karate is a perfect example of how one can achieve a big goal in small steps. When I first started my training, I never thought of becoming a black belt. However, every class I attended and every drop of sweat on my body brought me closer towards my next test, and the next promotion and another belt. There are 10 levels and 5 different color belts. I encourage you, and ever single one of you reading this post, to set a big goal for yourself. However, instead of saying: I will never get there, set a series of smaller goals – more realistic. Believe me, it works and it will get you there faster than you think. 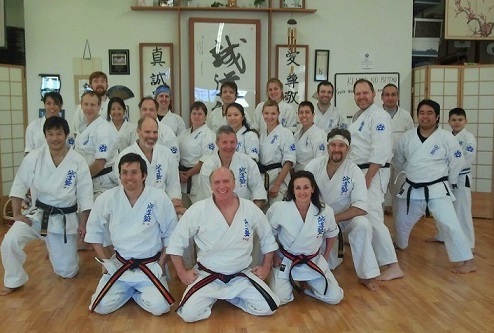 Here is a picture of my dojo, other students and instructors.